Hi, does sentrol support 64-bit applications created with XE2? 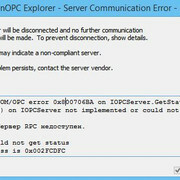 I also tried Tutorial_Lesson8_OPCProvider and got the following error. By the way, does sentrol support Delphi 10.2? Yes it should. I could not verify XE2 right away, but at least I managed to compile the Prosys OPC Simulation Server in 64-bit with XE4 and it worked fine, when I connect with Prosys OPC Client. Do you have a chance to try it with a newer Delphi compiler, in case this is just an XE2 compiler issue? BTW: If you happen to have registered both 32-bit and 64-bit version of the server, see https://mariusbancila.ro/blog/2010/11/04/32-bit-and-64-bit-com-servers/ on more details which one is used. And yes, Sentrol supports Delphi 10.2 Tokyo. Thanks for the note, looks like our product page hasn’t been updated accordingly. Fixed now. OK, I managed to reproduce (at least something) with the tutorial project (in XE4). If the server is started manually, I can connect with the client; otherwise I get a ‘Class not registered’ error. Well, that was just a server registration problem. So the tutorial project should work fine in 64-bit as well.